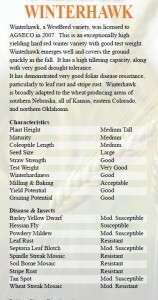 This is an exceptionally high yielding hard red winter variety with good test weight. Winterhawk emerges well and covers the ground quickly in the fall. It has a high tillering capacity, alongwith very good drought tolerance. It has demonstrated very good foliar disease resistance, particularly to leaf rust and stripe rust. 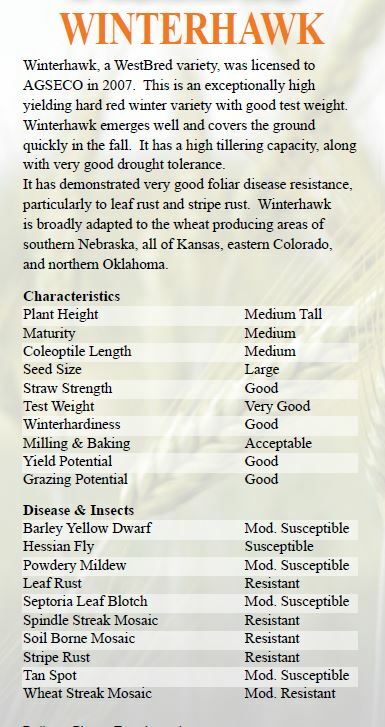 Winterhawk is broadly adapted to the wheat producing areas of southern Nebraska, all of Kansas, eastern Colorado, and northern Oklahoma.